In medium nonmetal bowl, stir together all marinade ingredients. Add beef strips; stir to coat. Cover; refrigerate 30 minutes to marinate, stirring occasionally. Spray 12-inch nonstick skillet with cooking spray. Heat over medium-high heat until hot. Add beef and marinade; cook and stir 2 minutes. Add onion and bell pepper; cook and stir 3 to 4 minutes or until vegetables are crisp-tender and beef is no longer pink. In small bowl, stir cornstarch and cold water until smooth. Add to beef mixture; cook and stir 1 to 2 minutes or until thickened. To serve, spoon 1/4 of guacamole down center of each tortilla. Top each with 1/4 of beef mixture. Top with salsa. Fold bottom edge of tortilla toward center; fold 2 sides toward center, slightly overlapping. 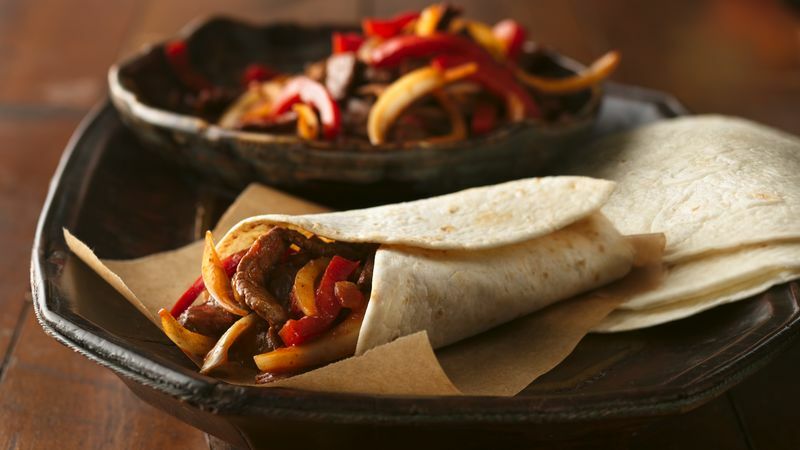 Serve fajitas with fresh pineapple or mango slices.